When I joyfully told a woman at my church that I'd be getting my children Radiation Sickness Pills for Christmas, she asked me, " . . . um, . . . What exactly does that mean?" That's when I realized that maybe I'd gone a little bit to an extreme. Again. 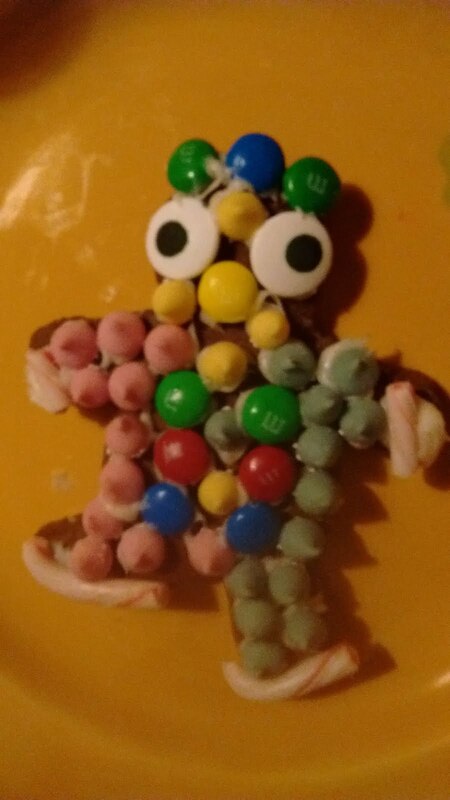 Is this a gingerbread owl? L-daughter went to town on this cookie. Because what I meant by that was that I'd bought Radiation Sickness Pills. For my kids. For Christmas. And I really hoped my kids would like the gift (even though I hope they never have to use the pills, ever ever). The pills were part of emergency preparedness kits that I'd pulled together, and my children got the rest of their kits, too. But I knew that the potassium iodide was the bow on the present, or the icing on the cake, or something. Backing up a bit: after the terrible hurricanes of this past summer and California fires that continue even now, I decided it made sense for me to double-check our own household emergency preparedness. I got really into Erica Strauss's series over at NorthWest Edible. In particular, she reminded people that they don't realistically have to prepare for every disaster, but they should prepare for emergencies that are eventually likely in their region, so they don't become a burden on emergency responders. Now, I'm super happy to be living in a place that is generally safe. We're far enough from large bodies of water that flooding means wet basements, but not helicopters pulling people off of rooftops. We aren't at the juncture of large faults that are likely to cause earthquakes big enough to disrupt traffic or electricity. We're far from the paths of most hurricanes. We're not in a forest fire zone; tornadoes are a true rarity here. So many of the disasters we read about in the news are unlikely here -- not impossible, I know, but very unlikely. So proud of the cookie, we're taking selfies with it! On the other hand, every few years we do get storms large enough to take out electric power for hours or sometimes days. Snow deep enough to shut down roads is inevitable, given enough time. 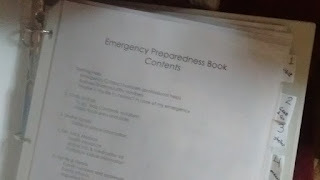 So: we made sure we have food in the basement we can cook without electricity; we have jugs with water; we have paper maps and paper versions of emergency numbers in case the internet croaks. We don't have flashlights, but we do have bike lights that we keep charged, and we figure that counts. My husband and I have had enough run-ins with cars knocking us down or bikes flipping over that we know medical emergencies are something to be ready for. We have lists of people to call in case one of us is out-of-commission for a while; we have photos of health insurance cards; we use LastPass to share important passwords. We also photocopy everything in our wallets once a year, in case one of us loses a wallet -- that practice has made our lives easier once or twice in the past. But in addition, our home happens to sit between two large nuclear reactors, one of which was once the site of worst nuclear plant accident in US history. Between that and the saber-rattling over in Kim Jong-un's neck of the woods, I figured that having potassium iodide at-the-ready seemed like a prudent idea. Odd fact: local drugstores don't stock potassium iodide; the only way for us to get it was to order it on-line. The directions say that you're supposed to take the pill within three hours of exposure to radiation . . . so that makes me even more convinced that having these in our cabinets just-in-case is a wise idea. Oog. This post is much longer than I meant it to be --- which is kind of the point of the present. 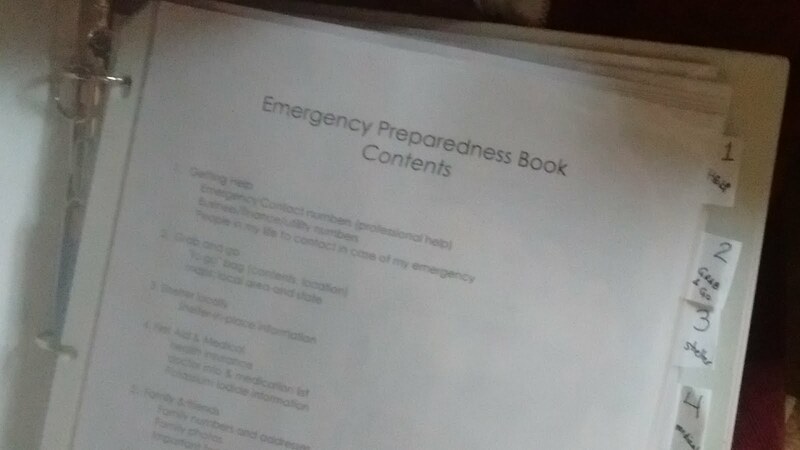 Putting together an emergency plan with information and supplies takes a bunch of time, and once I'd done it for myself, it wasn't that much harder to get a skeleton of an emergency kit together for each of my kids. Does the "!" mean emergency? Or party? Maybe it means both. 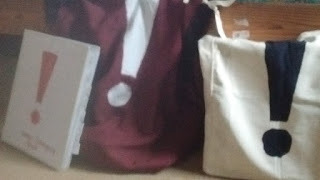 Each of my kids got a "Grab-and-go" bag pre-loaded with a few things they might need if they had to flee their own homes: a first aid kit, a water filtration straw, a hook for a spare car key. Also, each kid got an emergency book that I'd started for them, with places they could fill in their own additional information. Are you jealous yet? 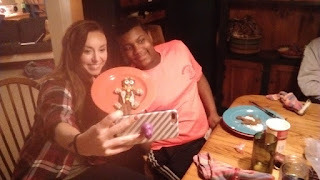 K-daughter was so happy about it she texted all her friends saying she has the coolest mom ever. Her friends might or might not agree, but they did say they were going to move in with her if the apocalypse comes. L-daughter asked if I'd gotten enough pills for her and her dogs. N-son was jealous of his sisters until he realized he was getting a book, too. My other daughters (I think) mostly thought, "well, that's Miser Mom for you", which is probably a healthy reaction to such an odd gift. 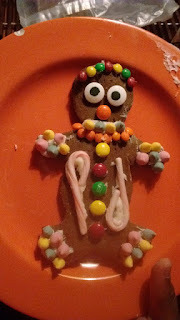 When I told my sisters about Christmas day and about the intense gingerbread decorating that took place, thought they'd prefer the gingerbread and eggnog to the potassium iodide pills. Me, too. Here's wishing everyone a safe and happy new year. OK... perhaps this just means that I'm as crazy as you are, but I totally LOVE this idea. With all of the sabre rattling that's been going on, I ordered my potassium iodide about 6 months ago... and I've got water and food in the basement to last a good, long time. But I totally LOVE the idea of an emergency grab bag, and especially the paper copies of important info - I never thought of that. I think I see a new project on the horizon! Wishing you and yours a very Happy New Year... may we never need any of our crazy lady emergency supplies! Thanks! I know lots of people that spend money and time on stuff they're never going to use, things that just clutter up the house. So without trying to obsess about zombies etc, I figure it's okay for me to spend a bit of money and time on something I hope I don't have to use, either. (And it's not that much clutter). This is a fabulous gift! I don't go in for Christmas gifts myself but since I'm bound to be in at least one exchange or another, I asked for all things for our survival kit as well! May as well save my money and make sure that we have what we need in case of The Big One hitting in our lifetime! A gift like this is certainly a conversation starter. I've had a bunch of friends who have heard about this tell me about the food and water in *their* basements. And I've had a bunch of other friends tell me that if bad juju hits, they're going to move into *my* basement! Do I need to store more water now?